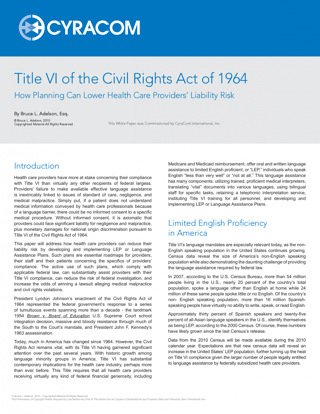 Health care providers have more at stake concerning their compliance with Title VI than virtually any other recipients of federal largess. Providers’ failure to make available effective language assistance is inextricably linked to issues of standard of care, negligence, and medical malpractice. Simply put, if a patient does not understand medical information conveyed by health care professionals because of a language barrier, there could be no informed consent to a specific medical procedure.